Something about crawfish gets people going in Houston. Whenever crawfish season hits if you do not make it to a boil or sit down for a huge heaping of crawfish you are definitely in the minority. 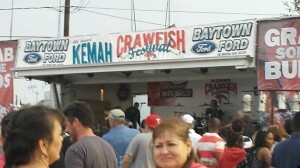 The Kemah Crawfish Festival is proof positive that crawfish has some serious fans. The festival combines crawfish with music, drinks and family fun all in downtown Kemah. There is something nice about a festival that is condensed so you are not walking down long streets to get to the music or the booth you passed up 2 hours before. This festival is set up all in one fair grounds with picnic tables set up to showcase the star of the festival…The Crawfish. Be prepared for the lines for the crawfish or beat the crowd by going early. All in all the crawfish itself received rave reviews. If crawfish is not your thing they have a variety of other booths with food ranging from fried fish to alligator and even churros are on the menu. The music and kids games added to the festive environment and most attending seemed to be enjoying the fun and food that always define a good festival. As an added bonus the festival occurs in the heart of Kemah so once you have had your fill there are bars and restaurants just steps away and for those who are more adventurous step over to the rides on the Kemah Boardwalk to complete your day of family fun. Today is the last day this weekend for the festival but look out for the sequel coming up in April.